This last entry in my log is difficult to write. My sun-blistered hand bleeds with the effort. The ink almost is gone, diluted with salt water to last until night casts its shadow. Salt-water marsh stretches to the horizon. I have one last sip of water for tomorrow. I am surrounded by salt-water crocodiles, some of the most fearsome beasts I have ever come across. It has been a week now since we struggled in vain against a wrathful sea. The last I recall was being slammed into the dark waters, the screams of my terrified seamen echoing in my ears. I was then awoken by the sharpness of this solitary rocky outcrop pushing into my battered body as I rolled in a gentle swell. I believe I am somewhere off the coast far to the south of Dunihk. I hold out little hope of a passing vessel - most mariners know of the danger posed by these treacherous waters and steer clear. My efforts to reach the coast have been thwarted by the crocodiles. They are truly monstrous beasts, their teeth as big as my forearm. They move swiftly, with deadly, silent intent. Were it not for the shallow waters of a low tide - the tufty marsh grass slowing their movement - my first encounter with these creatures would have been my last. The fury of the storm that crushed my ship could only have been unleashed by the Gods. And yet only the Gods could have saved me from those seething waters. But for what purpose? It appears that they have given me a choice, either the slow death of dehydration and starvation on this rock or violent death in the jaws of one of these beasts. The Gods have a curious sense of humor. This is an ignominious end for a most celebrated Explorer. Only last month I was feted by my Fellowship after recognition by the Supreme Council for outstanding service. Yet, none of those who slapped my back and toasted my success will know I have died - not that most would have cared. Some scribe will note that I did not return when expected. None will worry because they know that I am among the best, a survivor. And as my tardiness increases, so will their concern diminish, until one day, long after my body will have been pecked to the bone by sea birds, they will assume I am not returning. There will be a brief word, a moment of silence, and then one is forgotten. I can only hope that my discoveries are not eclipsed by another, at least for many a moon. I saw the Silver Moon last night and it reminded me of the night my father sat me down on a bench in the garden of the Fellowship house and told me of my future. He had prepared me well, telling me wondrous stories of undiscovered lands, mysterious beasts and long-lost treasures. He had also been rigorous, preparing me in languages, writings, and geography. When we traveled he trained my eye, asking me what I saw and then making me realize that I saw very little. The same day I entered the Fellowship as Novice, he was made House Governor. Then my training was left to others, his duties consuming him. Yet he still found time for me, testing my knowledge, my skills, my observation. His body is in the firmament, yet his spirit is with the Gods, watching over me. May he be by my side tomorrow as I try to reach the coastline one final time. As I gaze out over the endless marsh, I recall my oath to the Fellowship. "Knowledge which is unknown creates fear, and fear is the servant of Amulon. We, members of the Fellowship of Krin, are Warriors who gain knowledge in Fellowship to defeat the enemies of the Gods. I am a servant of knowledge and ignorance is my enemy. Unless the world is threatened, I shall not regard the consequences in my search for knowledge. Once found, it is my duty to share my knowledge with my Fellows, for in this way, knowledge is proliferated and we are strengthened. Nothing shall stand in the way of my fulfilling my Oath to myself, my Fellows, and my Fellowship." Of course, I had known the oath by heart long before my initiation. Even my mother could recite it, though she was not happy that I was to be a seeker of knowledge, for, as she well knew, it would lead me far from home. But she knew it inevitable: initiates to the Fellowship of Krin are recruited from the families of existing members - none else may be trusted by, or are worthy of, that membership. The possibility of death tomorrow makes me take stock. I think of the lands I have discovered, the beasts I have documented, the treasures I have unearthed, and I know my father would have been proud. I can draw satisfaction from my numerous entries in the Book of Discoveries. The discoverer of a knowledge is noted in this tome, along with the date of record. Each House of the Fellowship in the nine capitals has a Book of Discoveries. I have 301 entries in our House Book, more than any of my peers, both here and across the Kingdoms. I have mapped the Northern coast of Ishyr, uncovered the treasures of the lost Shernan tribe of the Onikha, deciphered Yunihk's Hexagon and sailed further Eastwards than any other to where the waters are stilled and the wind blows no more. Novices pointed and whispered as I passed, their eyes full of wonder and awe. 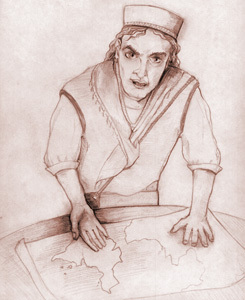 Our House Keeper, who is responsible for the contents of the Book of Discoveries, tried to incite a little competition by keeping a tally of discoveries by active Krin. Some of my Fellows were loath to be reminded of their preference for the comfort of an old House chair over the discomfort of the deck of a rolling ship. Most are lazy cretins, happy to rest on their aging laurels. The need to prove oneself, to test oneself, to compete with the best of the Fellowship across the lands, makes for a great Krin. Yet, I have not always been celebrated. The Fellowship is replete with ambitious Discoverers. And ambition, no matter codes of conduct, consumes all. Charges were once brought against me for breaking the House rules, for concealing a knowledge to ensure further financial gain. I can admit that this thought occurred to me on more than one occasion, and yet I would never sully the House. That charges were brought by my arch competitor, Toanna Haal, was no surprise. She is a beautiful but dangerous woman, deliciously unpredictable - just as likely to love you as to knife you. Of course, her charge was a ridiculously convoluted affair in which I was supposed to have conspired with Shernan pirates. Needless to say nothing came of it. If the charges had been substantiated, I could have been imprisoned or put to death. No matter, my discoveries still surpass Haal's in both importance and number. I had hoped someday to be one of the exalted Supreme Council, enforcing the Oath of the Fellowship, appointing the Keepers for each of the Fellowship's Houses and meting out justice. I fear that Haal's charges, no matter their spurious nature, have stained my reputation. I think I would have enjoyed imprisoning, expelling, or executing certain members, perhaps Haal among them. My discoveries have made me rich. The Charter of the Fellowship states that if a discovery has immediate financial reward, that reward is the property of the individual Krin, minus a small cut for the House, of course. Whoever discovers a knowledge and has it inscribed in a Book of Discoveries, receives all the immediate benefits derived from that knowledge (land rights, treasure, etc.). However, this is not without controversy. I fell afoul of the Ishyri Court when I claimed that the Northern Passage was the property of the Fellowship of Krin. While the Fellowship has clout across the Kingdoms, it does not have armed men to back up its claims. Of course, I was happy to settle for compensation from the Ishyri in the form of many bags of gold (I did threaten the Fellowship's significant political leverage if an understanding was not reached). My wealth grew as I progressed from Novice to Discoverer to Explorer. The Ishyri gold enabled me to acquire tracts of land in Alize with a view of the Inworld Sea. I also acquired The Intrepid. She was a stout ship and served me well. But wealth has not brought me companionship of any kind. The life of a successful Krin is a lonely one. I have known the most beautiful women on my travels, but none have had a taste for adventure beyond the bedchamber. I have had stalwart men at my side, but their motivation lasted only as long as the gold. I have had success because nothing has stood in my way, but there has been a cost in lives. The captain of The Intrepid had tasted the storm on the sea winds. He had proposed delaying our departure a day or two. As the black clouds swept over us I saw fear in his eyes. Perhaps I should have listened, just once. My ink runs out. Perhaps my greatest regret is not having a son or daughter. One with whom I could recount wondrous stories of undiscovered lands, mysterious beasts and long-lost treasures. With whom I might have sat in the sheltered courtyard of the House and shared my adventures. I fear I will never know what my father called his greatest joy, that of passing on his knowledge to his son. The light fades. May the Gods be with me tomorrow.